Both definitions, but particularly the second, aptly describe the three large new wall drawings that comprise Peter Soriano’s current exhibition. Made with acrylic and spray paint, the works codify and manifest Soriano’s perceptions of the spatial and temporal relationships between chosen objects. 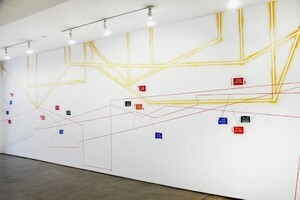 For previous works in an ongoing series of wall drawings beginning in 2012, he examined trees through a window, sections of metal rooftops, a group of rocks observed from the cardinal points of the compass, and a landscape glimpsed and noted at fifteen-second intervals from a moving train. More recently, three elements of a Richard Serra sculpture at the Colby College Museum of Art served as the starting point for a monumental work, Permanent Maintenance. (It was on view there for a year and was acquired for the permanent collection.) For the longest work in the current exhibition, Shadows (Penobscot), Soriano’s subject is the shape of shadows cast by the roofline of his house in Maine. At intervals, over a period of six months last winter and spring, Soriano staked the corners of the geometrically complex shadows and measured the distance of each from the house, then recorded the information necessary to recreate the shapes. He is intrigued, he says, by the seeming contradictions of shadows: immaterial yet concrete, describing as they do a physical relationship between object and plane. From his point of view, the house became a sort of sundial, the cast shadows marking increments of time. When he began creating Shadows (Penobscot), Soriano decided to reference the clapboards of the house with parallel horizontal lines, and inserted circular “portholes” inside of and around which he would describe the shadows under observation. He composed the work from left to right, largely without preparatory drawings, allowing it to unfold chronologically as the seasons advanced and the angle of the sun changed. Come spring, for example, as the morning sun caught a bit of the north side of the house for the first time, he indicated that detail with sprays of bright yellow in the concluding section of the finished work. In Synthetic Contrivance, under the skylight in the gallery, Soriano takes as his subject the shadows cast by his wife’s clothes strewn on a bench—but in this case the light is artificial and static, captured in a single moment late one night. In its examination of shadows from multiple viewpoints, Synthetic Contrivance is cubist in spirit. Beat-Up Subject, installed on the gallery’s west wall, revisits the shadows cast by the house in Maine, this time over a period of just three days in July. It is a reductive, diagrammatic work in which a viewer can decipher the contours of the shifting shadows, and perhaps puzzle out their connections to the schematic representation of the house. (The title is borrowed from Stuart Davis, who used the phrase to describe a well-used compositional motif.) After completing each of these works in his studio, Soriano measured and photographed the compositions, and wrote precise guidelines for re-installation. 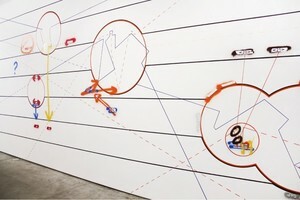 He executed the original wall drawings by himself, but intends that future iterations are equally authentic regardless of his participation, in the way that a composer writes a score to be performed by others, or that anyone can create a Sol Lewitt wall drawing simply by following his written instructions. Indeed, this exhibition was created by a small team of experienced and novice installers working alongside the artist over seven long days. These seemingly rational processes of Soriano’s wall drawings—the many measurements, the careful notes—yield results that are anything but rational. The works do not provide an apparent rationale for the viewer to derive meaning from the purported subjects, nor do they suggest that his inquiries could possibly lead to any useful conclusions. 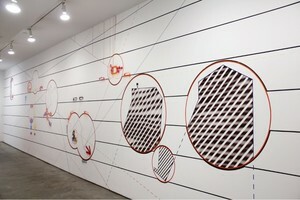 The finished works are as spontaneously unmoored as Eva Hesse’s latex-coated ropes, as paradoxical as Robert Smithson’s pseudo-science rocks and mirrors, as obdurately willful as Philip Guston’s paintings and as subjectively felt as Joan Mitchell’s translations of landscape into abstraction. Each of these artists is a distinctly different seminal influence on Soriano’s approach to creating visual manifestations of internal states of perception. Peter Soriano is a sculptor who no longer makes concrete objects, but already present in his early work was an affinity for the gap between a proposal of functional purpose and aesthetic resolution. His signature cast resin sculptures of the 1990s might resemble a sled, a bumper car, a cartoon sphinx or a mechanical part. They were colorful, ebullient, pop-inflected confections that gave way a decade ago to elusive exhumations of memory of inhabited spaces through irregular plywood box shapes and installations involving aluminum tubes, cables and turnbuckles anchored to walls and articulated with spray-painted dots, dashes and arrows. In the end, he decided that the physical components were getting in the way of his quest for metaphorical content and let go of the last vestiges of conventional sculpture in his work. He has set his sights on a liminal terrain in which his complicated, abstruse and challenging work might find harbor in a space between thought and feeling. Born in 1959 in Manila, Philippines, Soriano graduated from Harvard College and studied at Skowhegan before moving to New York in 1981. This is his seventh solo exhibition at Lennon, Weinberg since 1994. He has had numerous exhibitions in the US and Europe, and his work is in the collections of Harvard, Colby College, the Morgan Library, the FNAC and the Cartier Foundation in Paris. He lives and works in New York City and Penobscot, Maine. 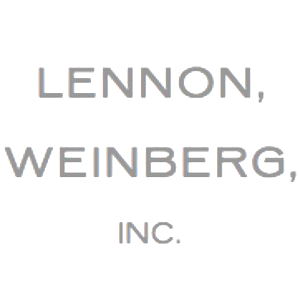 Image courtesy of Lennon, Weinberg, Inc.